I recently organised a meeting with a number of local residents about the upkeep and maintenance of Kew Bridge Railway Station. I met with representatives from Strand on the Green Association, St George's, Kew Green, The Kew Bridge Society, Express Tavern, West Thames River Group, a disability interest group, Friends of Stile Hall Gardens, Brentford Community Council and Network Rail. Prior to the meeting, I had already been in touch with Network Rail, to strongly urge them to deal with some of the key issues around the station. Network Rail confirmed at the meeting that, as a result of my request, they had immediate plans in place now to paint the station, address the rodent problem, board up unused windows and clear graffiti They had also requested additional litter bins from Hounslow Council. At the meeting, St George's highlighted the work they had been doing too to clear up graffiti in the local area. I am very pleased that Network Rail responded so well and are giving Kew Bridge Station a 'facelift,' which will help local residents. It will make the station seem cleaner and safer and I welcome their efforts to improve it for passengers. As a group, we are also in discussion regarding the future of the station building at Kew Bridge. As it is a Listed Building, it is obviously of architectural importance. It would be excellent if it could be restored to its former glory and put to good use. The group is going to meet again within the next month to review progress and discuss next steps. I recently invited local schools to join me in a visit to the Olympic Park in East London. I was joined by Chiswick Councillors Todd, McGregor and Oulds, as well as the School Sports Partnership based at Isleworth and Syon School, Chiswick Community School and Brentford Football Club. The visit was arranged since I was part of the Olympic Bill Committee in Parliament. The bill made a small number of technical amendments to the advertising and trading, ticket touting and traffic management provisions of the London Olympic Games and Paralympic Games Act 2006. The Bill also introduced measures to extend the powers to seize unauthorised and fake merchandise and raise the find for Olympic ticket touts from £5,000 to £20,000. During the debate, I raised the issues of the lessons London can learn from other hosting countries, how the traffic conventions during the Games will be enforced, as well as their impact on non-Games related traffic. Having seen how much has already been achieved at the Olympic site with just a year to go until the Games, I believe the London Olympics and Paralympics provide us with an outstanding opportunity to showcase the best we have to offer to the world. Londoners, who have contributed to the success of the Games, should be encouraged to get involved as much as possible, either through attending or volunteering. Let's make this the best Games ever, showing the best of what London and the UK can offer. Let's also do all we can to create a really strong, lasting legacy and use this for getting more young people involved in sport, creating stronger communities, great team spirit and a healthier nation. With just over a year to go before the London 2012 Olympics, I want local residents to consider nominating someone to be a Torchbearer for the Games. Do you know someone truly inspirational or someone who always strives to do their best? Out there are ordinary people doing extraordinary things - people from all walks of life and from all over the UK. I need your help to find them. The Olympics' organisers are looking for truly incredible individuals whose personal stories will inspire millions of people watching the Olympic Torch Relay - in their community, across the UK and around the world. It would be great to see a representative from Chiswick, Brentford, Isleworth, Osterley or Hounslow carrying the Olympic Torch in the Relay. I really do hope that local residents will consider who they think deserves to take part and then nominate them. I believe that the London Olympics and Paralympics provide us with an outstanding opportunity to showcase the best we have to offer to the world - and that should include the people of our local area. If you know someone who has inspired you to do something you never thought possible, someone who always tries to be the best that they can be, someone who makes a real difference in their school or local community, someone who has shown what it means to be a real friend, a person who shows respect for other people and knows the importance of fair play, in essence, a person who truly represents the Olympic spirit - then please nominate them. Nominations close at 11.59pm on 29th June 2011. I can hardly believe that a year has gone by since the General Election! It's been an incredibly busy year, balancing the workload in Parliament with responding to residents' emails and letters and getting out and about in the constituency. I've met some wonderful people at my Advice Surgery and elsewhere and seen the fantastic work that is going on in businesses, schools and voluntary organisations across Chiswick, Brentford, Isleworth, Osterley and Hounslow. It will be a challenging year ahead for many I know. I strongly believe, that working together, we can create a better and stronger local community for us all. The early highlight of the year was stopping the 3rd runway at Heathrow. Throughout the year, it has been great to be able to make a difference, however small, in helping individual residents resolve their problems. The lowlight so far was hearing about planned closures of Day Centres and other key local services but I am positive about continuing to work with local residents, campaigners and Hounslow Council to find a solution. New research from Warwick University published in the European Heart Journal in February this year studied the impact of hormones and chemicals caused by chronic lack of sleep in the body. They concluded that: "If you sleep less than six hours per night and have disturbed sleep, you stand a 48% greater chance of developing or dying from heart disease and a 15% greater chance of developing or dying from a stroke." The World Health Organisation and the HYENA report from Imperial College London also found that, even if people don't wake up, there is evidence that noise from night flights causes immediate increases in blood pressure. I hope that the Government's current consultation on the future UK aviation strategy marks a positive step forward in relations between the Government and the aviation industry. I want us to ensure that Heathrow airport continues to thrive and, at the same time, takes into account the quality of life of those who live around the airport. "Memories of India" has won a place in the Regional Final after I selected the restaurant to represent Brentford and Isleworth in the prestigious Lyca Tiffin Cup 2011 competition. The national competition is held each year to find the best South Asian restaurant in the country. This year 60 restaurants were nominated. "Memories of India," having won a place in the regional final, will battle with other restaurants from the same region to become one of the national finalists in the Lyca Tiffin Cub 2011 Grand Final. Within the next few weeks, a mystery diner will visit the restaurant and judge whether it deserves to represent the region. I am delighted that my nomination for "Memories of India" has been accepted. I hope that "Memories of India" will be chosen to represent our region in the Grand Final of such a prestigious award. I am sure everyone in Brentford and Isleworth will be supporting our restaurant. Keith Vaz MP, Chair of the Tiffin Club, tells me he is delighted with the nomination of "Memories of India" - it will really put Brentford and Isleworth on the culinary map. I recently spent a day with a team from the British Transport Police in Chiswick. I visited the level crossing in Grove Park Terrace to find out about Operation Galley - London South's initiative to reduce non-compliance at level crossings. Operation Galley involves a specially adapted British Transport Police van, which is able to monitor vehicles and pedestrians crossing the level crossing. I was shown how the operation is conducted, as well as being given a full tour of the newly built vehicle which was sponsored by Network Rail. The new van allows the British Transport Police to immediately issue a fixed penalty notice of 3 points and a fine to drivers, and an on-the-spot fine for pedestrians, who chose to cross the level crossing once the yellow lights are flashing. I would like to pay tribute to all the hard work that the British Transport Police does in ensuring that our railways are kept safe, both for staff and rail users. In July last year I was concerned to hear about a bus failing to stop at the level crossing in Bollo Lane, just outside my constituency. Although one passenger was showered with glass when the back window of the bus was broken by the descending barriers, miraculously no serious damage was done. But I am well aware that this was pure chance. Drivers who fail to heed signals at level crossings put not only themselves in danger, but endanger the lives of train passengers also. I therefore very much welcome this new initiative by the British Transport Police and Network Rail to catch and prosecute drivers who do not obey signals at level crossings. 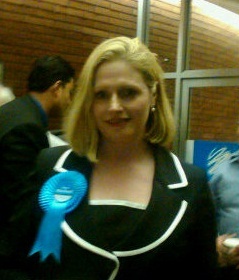 I am Mary Macleod, Member of Parliament for the Brentford and Isleworth constituency in west London. This includes Chiswick, Brentford, Isleworth, Syon, Osterley, Hounslow Central, Hounslow South and Hounslow Heath. On this blog I'm going to tell you my latest news, and also set out some of my views. I hope you will take the time to comment on them - I want to learn what you've got to say.